You don't need a sewing machine to create some beautiful handmade projects. In fact, all it takes are a few tools, a bit of fabric, some free hand sewing patterns, and a dash of creativity. 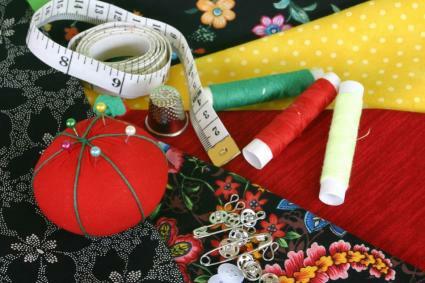 Whether you're just learning to sew or are refining your hand sewing skills, you can create something special. If you need help downloading the patterns, check out these helpful tips. This beginner-level hand sewing pattern is perfect if you want to make some fun accessories for yourself or create some unique gifts for friends and family. You can also use this pattern to introduce kids to the fun of sewing. Print out the pattern for the flower and cut it out. Cut one flower shape out of each color of felt. Consider using a darker shade for the center and lighter shades for each layer. Stack the three flower shapes together according to size. The largest should be on the bottom, and the smallest should be on the top. 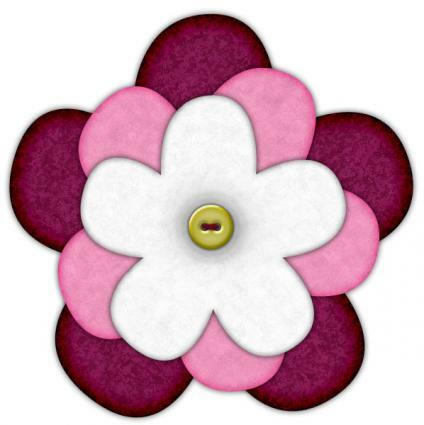 Place the button in the center of the top flower shape. Start at the back of the flower stack, and sew up through all three layers. Sew the button onto the center, securing the three layers together. When the button is secure, bring the needle back down to the bottom of the stack and sew on the pin back. Instead of felt, make your flower out of fleece, linen, silk, or another fun fabric. Leave the edges raw for a pretty effect. Choose an antique or vintage button for the center of the flower. Substitute a pretty bead or several beads for the flower center. Instead of making a brooch, attach your flower to a hair clip, headband, or other accessory. Add flowers directly to clothing items, hats, backpacks, and more. Get the pattern for this mini quilt! The traditional way to make a patchwork quilt is by hand, and many quilters still choose to make their projects this way. There's something special about using your hands to create a coverlet for a special friend or even for a baby. This mini-quilt pattern will help you make a beautiful four-foot by four-foot lap quilt or infant quilt. Start by printing out the pattern piece. If possible, print the piece on heavyweight paper or cardstock, since you'll be using it to cut out lots of pieces. Spread out your first quilt fabric and iron it to eliminate any creases. Using the pattern piece, cut out eight squares from this fabric. Repeat this process with each of your eight fabrics. When you're done you'll have 64 squares, sorted by color. On a flat surface, lay out your quilt the way you'd like it. One good option is to arrange the pieces in the same order for each row, moving the first print from one row to the last position on the next row. 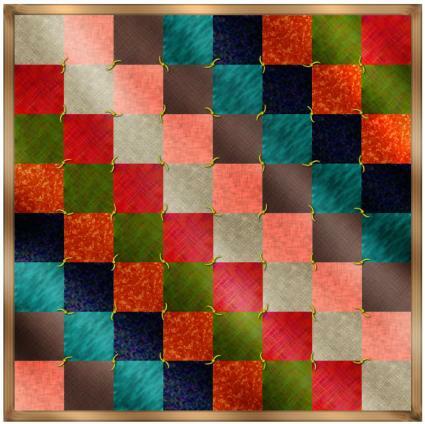 This is the pattern illustrated in the finished image of the quilt. Once you have settled on a design, stack your pieces for each row. Take the first two squares of the first row and place them with the right sides of the fabric together. Hand sew a seam a quarter inch from the edge of one side. Open up the two pieces, add the next square in the row, and continue until the row is complete. Set the row aside and go on to the next. When all the rows are done it's time to sew them together. Stack the first two rows with their right sides together and then pin to hold them in place. Try to make sure each seam matches up with the one on the other row. Hand sew a long seam to connect the two rows, leaving a quarter of an inch for seam allowance. Continue adding rows in this manner until the entire quilt front is assembled. Use your iron to press the quilt front flat. Spread out the fleece fabric, and lay the quilt front on top of it. Cut out the fleece so it is exactly the same size as the quilt front. Stack the fleece and the quilt front together and pin to secure. Around the edge of the quilt, begin attaching the blanket binding to the outside quarter inch of the quilt and fleece fabric. Use a catch stitch to secure the binding to the quilt. To perform a catch stitch, take a small stitch on the quilt side, move diagonally to the binding side, take a small stitch there, and move back to the quilt side. Continue until the entire binding is attached. Finally, use embroidery floss to tie the quilt at each corner of fabric. Start in the center of the quilt to keep the layers even. At each corner where one fabric square meets another, stitch from the front side of the quilt, down through the fleece backing, and back up through the front again. Tie a knot in both ends of the floss, and trim the ends to one inch in length. Continue until there is a knot at every corner. Make a lap quilt out of old clothing or fabric with memories attached. This makes a wonderful gift for a grandmother. Create a baby quilt for a shower by having guests sign several blank fabric squares to use in your quilt. Make your quilt larger by adding more squares to each row and more rows to the end of the quilt. The quilt gets a foot longer for each two squares you add to any row. Instead of tying the quilt with embroidery floss, hand quilt it on each square. Use fabrics of different textures to make a fun quilt for a child. Make mittens by hand using these simple mitten patterns, perfect for men, women, or children. Use this tutorial and free pattern to hand applique cute designs to the front of baby clothes or shirts. Create a cloth doll using this simple pattern. This is a great project to make with kids. Make a simple tote bag using one of these free patterns. Regardless of what you choose to make, hand sewing is a great way to create something that shows your love. Because hand sewing takes longer and involves more hands-on work, people will know that your project really shows how much you care.